The colorful Lajkonik Parade takes place late in spring. Krakow region has always been rich in colorful folk traditions, handed down from generation to generation. Christmas Eve’s night begins with a family feast of 7-12 special dishes–no red meat and at least one course of carp–followed by presents unwrapping and carols singing, and it ends with popular ‘pasterka’, i.e. the midnight ‘Shepherds’ mass’, in a favorite Krakow church (or simply the nearest one). Christmas and notably the following holiday on December 26 are traditionally occasions in Poland for visiting friends and relatives. In the ensuing holiday season also popular are such family pastimes as Nativity Plays, seeing elaborate Nativity scenes in various Krakow churches and the museum display of the best examples of famous Krakow cribs built over the last year. New Year merrymaking is a must worldwide but on that night Krakow’s entire Old Town historical district turns into one giant ballroom. Thousands of revelers swarm its huge Grand Square with the adjacent streets in frenzied rejoicing and pack into the area’s countless clubs, cafes and restaurants. Such is the beginning of Krakow’s long carnival season which ends with the Shrove Tuesday frolics weeks later. Kolednicy’ carol singers, mostly children, wander with a Christmas crib from door to door over the holiday season. In reward for chanting a couple of Polish traditional noels they get some change. In the past the kolednicy used to be adult and they performed an elaborate Nativity puppet show. Fat Thursday, the last one before the Ash Wednesday, is a festival of overeating when every Krakow dweller devours the Fat Thursday specials: ‘favorki’ crunch cakes and the Polish doughnuts (balls with rose-petals jam filling) which are a must-eat treat on that day. Shrovetide (Polish ‘Ostatki’ or ‘Zapusty’) crowns Krakow’s two-month carnival season. The Shrove Tuesday’s ‘sledziowka’ festivities traditionally last till dawn on the Ash Wednesday and they end with the Lent meal of herring after which repentant revelers go straight to the church to have their foreheads strewn with ash. Lent’s 40 days are marked by profusion of special services and ceremonies in beautiful Krakow churches, culminating over the Holy Week, notably in the Good Friday’ mournful rituals. Most striking is the hooded procession of the 400-year-old Archfraternity of Lord’s Passion, known also as the Brothers of Good Death, held every Friday throughout the Lent at the 13th-century Franciscan church in the very heart of the city. Easter festival spreads over four days in Krakow. On the Holy Saturday everybody visits the parish church with a basket of the traditional Easter foodstuff–bread, eggs, ham, sausages, and a piece of horseradish–to have them consecrated by priest, and to see ‘the grave of the Lord Jesus’ arranged in a chapel or a crypt. Easter Sunday traditionally remains quiet and confined to the family and the church. Yet Easter Monday is devoted to socializing, the centuries-old Emaus fiesta being the chief venue. Also Poland’s tradition is splashing water over one another on the Easter Monday; teenagers do it with zest and by bucketful. Another Krakow’s time-honored fair, called ‘Rekawka’, takes place on Tuesday after Easter. ‘Smigus’ means Poland’s universal custom of splashing over one another with water on the Easter Monday. In the past village boys used to drench girls for good luck in finding a husband, whipping them first with willow rods. All Fools’ Day on April 1 or ‘prima aprilis’ is universally observed in Poland: expect endless pranks, jests, and innocent lies. Lajkonik Parade on the first Thursday after the Corpus Christi feast proceeds for about three hours from the Zwierzyniec Premonstratensian convent of St Norbert to the central Grand Square, accompanied by loud and high-pitched music. 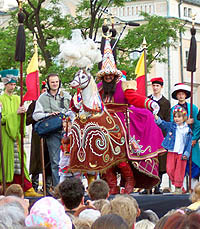 Participants sport either Krakow folk costumes or fancy oriental attire. Lajkonik is their leader–bearded fellow in a Tartar disguise rides a wooden horse and prance joyfully around. Wreaths (‘Wianki’) Midsummer festival is the Krakow variety of Poland’s traditional all-night merrymaking by bonfires on St. John’s Day, June 24. In Krakow it has always started with girls floating wreaths of magic herbs with lit candles down the Vistula river. Since the 19th century the ancient custom has turned into a popular fiesta and a great show with musical acts and fireworks display upon the riverbank opposite the Royal Wawel Castle. ‘Zielone Swiatki’ Whitsunday feast is the occasion for joyful gatherings at night by numerous bonfires. ‘Andrzejki’ universal partying on the night of St Andrew’s Day, November 30, has folk origin, reminded at a break in dancing by fortune-telling from shapes melted wax takes poured into water. All Saints’ Day, November 1 (as well as, to a lesser degree, All Souls’ Day, November 2) is spent in Poland on visiting cemeteries and commuting between them. Everybody prays at graves, decked with fresh flowers for the occasion, of the deceased relatives, and lights candles. ‘Mikolaj’ on St Nicholas’ Day, December 6, has been always the date when children in Poland expected Santa Clause bringing gifts. Except nowadays Santa usually bothers again on the Christmas Eve. Newly built famed Krakow Christmas cribs–tens of them, from tiny to giant–can be seen before noon in the first ten days of December round the Grand Square’s monument to Adam Mickiewicz. Successful entries for the yearly. Matter-of-fact as they are in their work habits, and while family and family life remain most dear to them, Krakow dwellers generally relish good company, good food, and having plenty of free time. Hardly a month passes in Krakow without some time-honored occasion for common festivities or colorful celebration. Krakow residents enjoys a long season of merriment that lasts from the New Year’s Eve till the Shrove Tuesday some two months later. It is marked by feverish partying in Krakow’s numerous clubs on the one hand, and snobbish charity balls on the other. Copyright © 2015, 2016, 2017, 2018 by MAREK STRZALA. All rights reserved.